Each semester the student will validate 30 ECTS credits. During the first three semesters, the student will validate all compulsory and optional courses that he chooses in order to obtain 30 ECTS credits per semester. The fourth semester will be validated after the defense of his thesis. The final grade will take into account the fieldwork or internship carried out during this last semester. The student must adhere the rules and regulations set by each university will have to be respected. During the fourth semester, students will have to conduct a fieldwork on a topic that they have chosen with their supervisor. Students may choose as co-supervisor any lecturer from one of our academic partners. The research thesis (30 ECTS) must follow the guidelines of the university in which the student will defend it and where his supervisor is based. For the fourth semester, the student will carry out an internship in one of our non-academic partner. An internship convention will be established between the university where the student is enrolled, his thesis’ director and the hosting institution. Students will also have to write a thesis (30 ECTS), following the guidelines of the university in which the student will defend it and where his supervisor is based. All student will sign -upon their arrival at the Universidad de Salamanca- a student agreement, stating their rights and obligations. The student will carry out administrative and pedagogical enrolments in the university where they will study during their mobility. 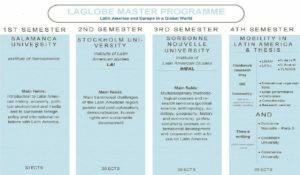 However, they will keep continuous contact with LAGLOBE’s coordinating team of the Université Sorbonne Nouvelle. The Paris’ team coordinates all administrative aspects (registrations, mobility, diplomas), and support the student with the administrative formalities.